Ice is ubiquitous on Earth and on the outer planets and satellites of the solar system. Ice is an important geologic material, and is a critical contributor to global climate and sea-level models. Understanding and modelling the dynamic behaviour of the glaciated regions on earth and in the outer solar systems requires an intimate knowledge of the mechanisms that control the mechanical behaviour of ice polycrystals. During dynamic events, such as rapid heating or ice-shelve collapse, much of the response of ice sheets is governed by its internal deformation, that is, the ductile flow behaviour of the ice. Ductile flow in ice is primarily controlled by temperature and the arrangement of ice crystals into crystallographic preferred orientations (CPO), which both have a dramatic effect on flow rates and mechanical anisotropy. Seismic field surveys provide a window into the regional characteristics of ice sheet flow, via the relationship between CPO and polycrystal elastic anisotropy. That is, CPO effects the velocity of elastic waves travelling at different directions through a textured polycrystal. CPO geometry in ice evolves as a function of deformation conditions such as temperature and the stress field. Thus, elastic anisotropy can be used to interpret mechanical anisotropy, an important parameter for predicting long-term ice sheet behaviour. Here, we present the results of several un-confined uniaxial compression experiments on cylinders of isotropic polycrystalline ice under controlled temperature and displacement-rate conditions. The deformed material was characterised in real-time by measuring ultrasonic time-of-flight in-situ during ductile creep, and post-deformation using cryo electron backscatter diffraction to characterise the final microstructure. Resonant ultrasound spectroscopy measurements were made on cylinders of synthetic isotropic ice polycrystals, to determine the relationship between temperature and the elastic and anelastic characteristics that govern wave propagation in ice. At high homologous temperatures (-5°C), uniaxial shortening gives rise to a CPO cone girdle, where the c-axes of the individual crystals become aligned into an orientation 30-50° from the shortening direction. The evolution of this CPO is controlled primarily by strain-energy driven grain boundary migration, where grains in orientation favourable for slip on the basal planes grow at the expense of those in hard slip orientations. Grains in hard basal slip orientations deform by non-basal slip on pyramidal planes. Rapid weakening occurs in the samples around 3% strain, and corresponds to the formation of a network of grains well oriented for basal slip. Through in-situ measurements of elastic wave velocity evolution, we observe that changes in ultrasonic velocity anisotropy can be used as a continuous proxy for CPO evolution, quantifying the relationship between velocity anisotropy and fabric strength. Resonant ultrasound measurements show that elastic wave velocity is strongly sensitive to temperature in ice polycrystals, as are the components of the elasticity tensor. These measurements reveal that compressional wave speeds and intrinsic attenuation are most sensitive to temperature, which we attribute to liquid phases on ice grain boundaries associated with pre-melting conditions. 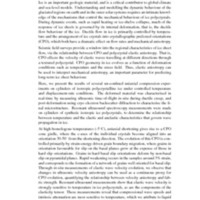 Vaughan, Matthew James Hatfield (Matt), “The creep behaviour, and elastic and anelastic properties of polycrystalline ice,” Otago Geology Theses, accessed April 22, 2019, http://theses.otagogeology.org.nz/items/show/657.